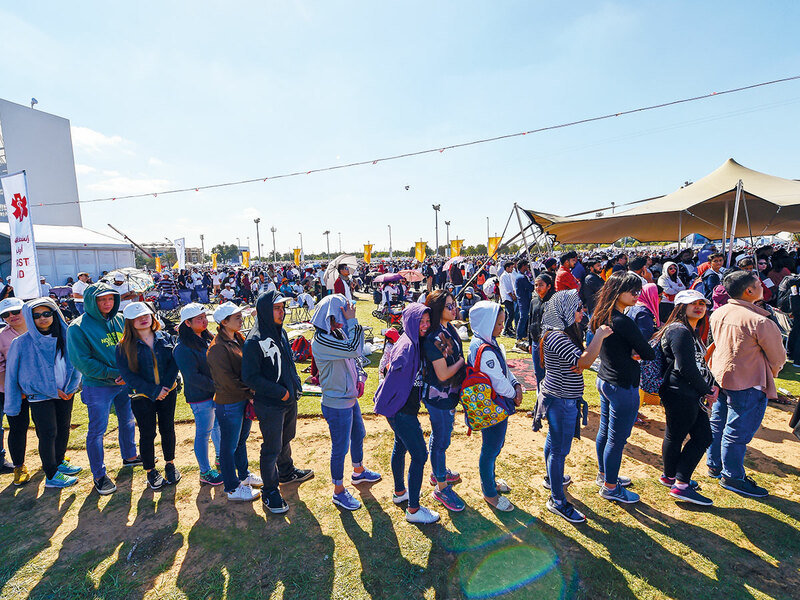 Abu Dhabi: A day after Pope Francis’s historic Mass in Abu Dhabi, Gulf News was given a rare insight of the logistical challenges behind the mega event that caught attention of the entire world. 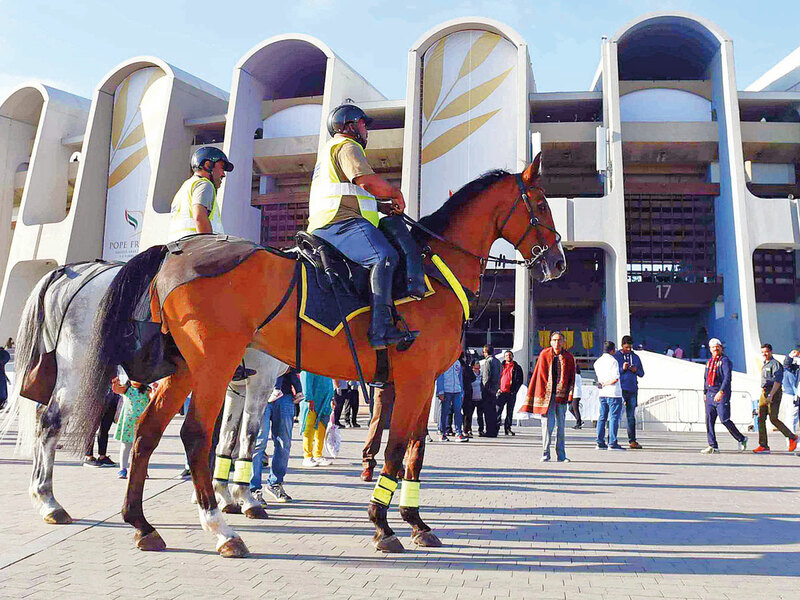 A young Emirati woman official, who was in charge of the preparations, on Wednesday said arranging the stadium within 72 hours for 180,000 people, after the Asia Cup Football ended on February 1, seemed like a big task. “We had a feeling that if we got some more time, at least a couple of days more. But there was no way to change the pre-scheduled AFC cup. However, when we all worked together, we did our very best. Top officials said they were confident in us to accomplish the task in limited time,” Aisha Al Bakoush, Head of Events at Presidential Protocol in the Ministry of President Affairs, said in an exclusive interview at the Presidential Palace in Abu Dhabi on Wednesday. She said a big team of around 2,000 volunteers and 5,000 strong workforce led by government officials worked 24 hours in three shifts in three days at the stadium. “We [the officials] almost had sleepless nights those three days. I think I slept less than five hours in those 72 hours. Finally, when everything was done by Monday late night, we all had a chance to go home and sleep until early morning. But we stayed back in the stadium to enjoy the excitement of accomplishing the Herculean task,” Al Bakoush said. Laying a wooden platform on grass ground to arrange chairs without damaging the grass was a major task. Then carpet was put to make it beautiful and safe, she said. Tickets were distributed by the churches. Volunteers were selected from different voluntary organisations, irrespective of their religion and nationalities and they were briefed in advance about their task. “The leadership had insisted that officials and volunteers on the ground must be cheerful while interacting with people and everyone rose to that expectation,” she said. We almost had sleepless nights those three days. I think I slept less than five hours in those 72 hours. Finally, when everything was done by Monday late night, we all had a chance to go home and sleep until early morning. But we stayed back in the stadium to enjoy the excitement of accomplishing the Herculean task. Health, Safety and Environment (SHE) systems, additional toilets, seating plan, food and related matters for all participants and access for differently abled people were planned in advance to be in place when gates are opened at 5am. 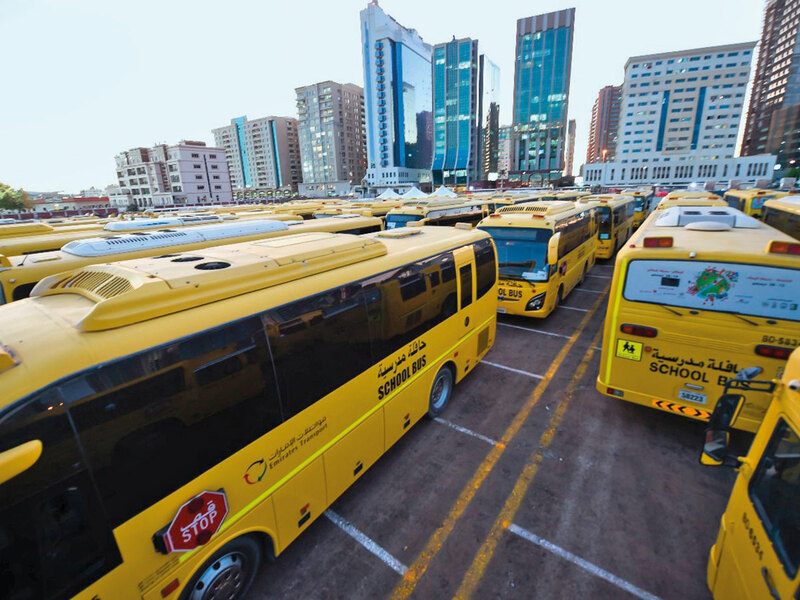 For example, people from other emirates started reaching by buses at Bateen Airport parking area by midnight. The park had the capacity for just over 6,000, but people just collected food and moved to other vacant places peacefully, she said. Around 10,000 people reached the gates by 3am, which grew into 40,000 when the gates were opened by 5am. They all waited and took their seats very peacefully. Thousands of people turned up without tickets. Some of them were let in. All 180,000 participants left within 3.5 hours after the mass ended at 12 noon. The last one left the stadium at 3.30pm. “When we talk of tolerance, coexistence and living together, papal mass of 180,000 people in a Muslim country that does not have a single Christian citizen is a perfect example. Muslims, Christians and people of other faiths worked together to make it possible. We are proud of this achievement,” Al Bakoush said. 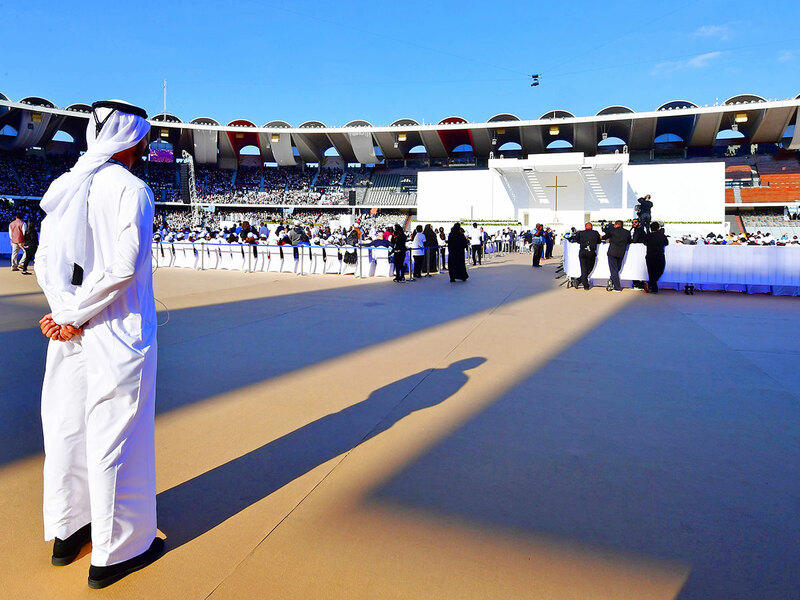 A group of Emirati officials visited Vatican in December and attended two papal masses as part of their preparations for the pope’s visit to Abu Dhabi. “Since we are not familiar with Christian rituals, we made a lot of research and studies. 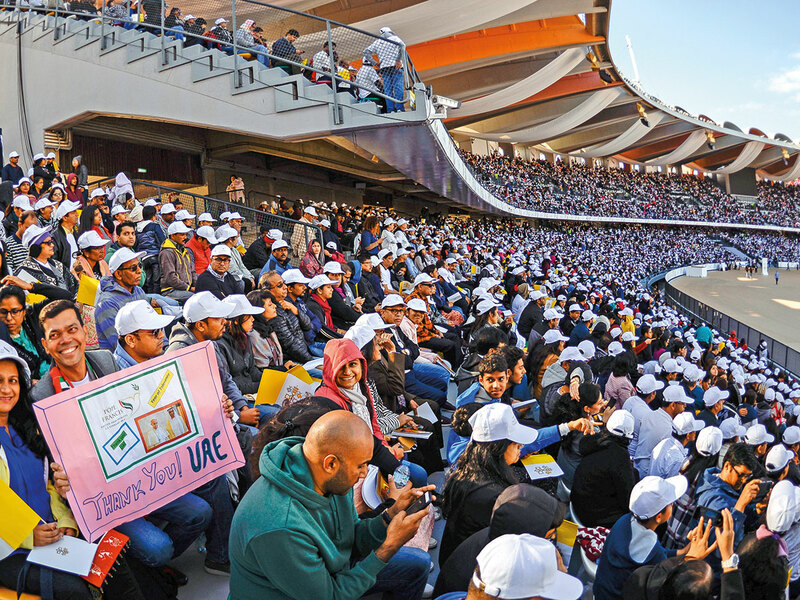 Still when we wanted to experience the mass directly, the top officials permitted us to visit Vatican,” an Emirati woman official who was in charge of the preparations told Gulf News on Wednesday. Vatican officials received the delegation very warmly and guided them about the preparations, said Aisha Al Bakoush, Head of Events at Presidential Protocol in the Ministry of President Affairs. The official has been working with the events department for two years. When she was promoted as the head of events in early December, she never imagined that a prestigious and tough task was ahead. The pope’s visit was announced on December 6 and the 33-yeard-old woman official had to lead the preparations. “His Highness Shaikh Mohammad Bin Zayed Al Nahyan, Crown Prince of Abu Dhabi and Deputy Supreme Commander of the UAE Armed Forces. wanted the youth of this country to be prepared to take up any tasks. That confidence on the youth gave me the courage,” Al Bakoush said.